EARLY BIRD PRICING - SAVE $5 PERSON UNTIL OCTOBER 1ST! Take out your lederhosen and mark your calendars for October 6th from 5pm to 11pm. With live music, DJ & dancing, a 50/50 draw, your favourite beer foods, yodeling contest and prizes for best costumes, beer of course... plus a cocktail bar for those who like to mix it up. You will get two 12oz glasses of local craft beer or cider in your own stein that you can keep. 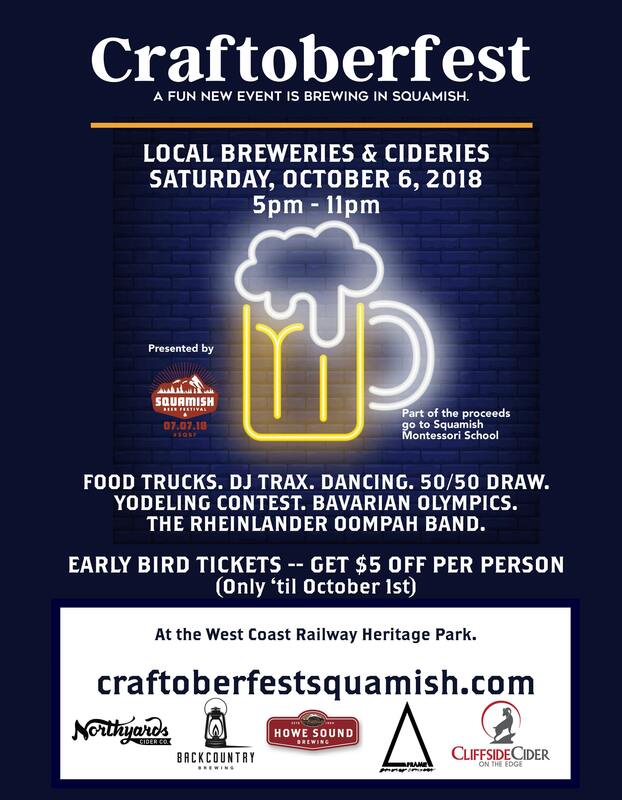 Featuring local Sea to Sky brewers and cideries it's another great craft beer event brought to you by the creators of Squamish Beer Festival. Access to the best party in town!